The app gives users the ability to create a custom block list, among other features. Truecaller has announced the launch of its updated app on Windows Phone devices. In addition to a new app design and tips to help users get started, the app now offers advanced blocking features to help users avoid spam or scam calls. With this update, a user’s call history will be automatically populated with any available Truecaller information, which may include names and profile pictures. The app’s caller ID feature has also been updated with carrier and location information, based on area codes and number series. Once a call ends, the new ‘after call screen’ gives users access to shortcuts for calling the person back, sending them a text message or saving them as a contact, without opening the Truecaller app itself. Users can also mark the number as spam or look it up in Truecaller. To avoid spam calls, users can now compile their own custom block list, which supports blocking calls from all ‘hidden’ or ‘private’ numbers. Truecaller also identifies the ‘top spammers’ in a user’s region. We are working to reinvent the communications experience for billions of people, and it has always been in our DNA to bring the best version of Truecaller to all the operating systems. [T]oday, with the hard work of our great team, and our contacts at Microsoft, we are excited to bring our most comprehensive version of Truecaller for Windows Phone, to date! 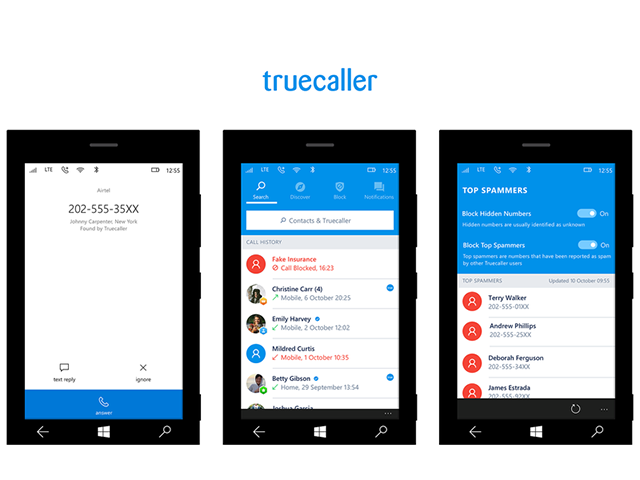 Trucaller is available to download for free on the Windows Phone Store. The app is also available on the iTunes App Store and Google Play.